You know when it’s time for new ink, but sometimes choosing an idea to go with can be the hardest part of the process. Here at Majestic, we get a lot of clients asking our advice on what they should get tattooed. We believe that a tattoo can be a creative way to express your imagination and personal interests, so we always recommend our clients to spend plenty of time thinking about what matters to them. In many cases a tattoo can be a great way to express yourself. This being said, avoid putting the word ‘tattoo’ in your image search. Each piece should be unique work of art and taking someone else’s design isn’t a good way to get satisfying results. You limit the creative flexibility of the artist, and end up with a copy of what was and original design. Ask yourself what you like about a specific tattoo and incorporate your findings into a custom project instead. So you know what you like, but you still can’t seem to figure out what to get for a unique tattoo. A great way to get tattoo ideas is to look at lots of different kinds of images, and start a collection of material that appeals to you. It doesn’t matter if it isn’t exactly what you want tattooed. You may only like a section of the picture or want to change the colors. You can find tattoo inspiration from art, nature, patterns, stories, color schemes, or virtually anything that strikes your fancy. Load up your flash drive, and bring along your finds to your consultation. With Adal’s help, chances are you’ll leave with new fresh ideas you wouldn’t have expected! 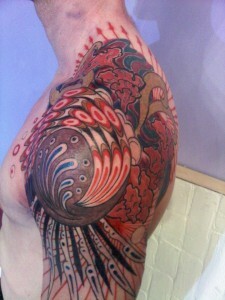 Looking through the tattoo artist’s portfolio is another great way to get inspiration for a new piece of work. A good portfolio can tell a lot about the strengths and specialties of a tattoo artist. For example, if you find a portfolio contains a lot of samples of flowers and color tattoos, chances are this is the subject matter that artist really enjoys doing. You will notice in Adal’s portfolio there are many examples of colorful, unique and organic designs. It is no coincidence that these designs make the best kind of cover up tattoos, which Adal also specializes in. Next time you are stumped about what direction to take your tattoo, consider asking your tattoo artist to incorporate elements of their personal style. This will almost surely guarantee you will get a creative and inspired result that will be loved for years to come. The location of your ink will be an important factor in the design. A tattoo on your arm will be drawn up in a different way than a tattoo on your chest. Consider the placement of a more intimate tattoo versus one you will be displaying on a regular basis. Learn more about where you should get your tattoo. Not all tattoos are created equal. There are many different kinds of tattoo styles and each one comes with a different set of aesthetic guidelines. Styles can range from biomechanical to Japanese, and from realistic to abstract or geometric. Adal has a portfolio of unconventional tattoos based on non-traditional inspiration. If you are in the market for something different, consider bringing in your ideas to Adal for a custom drawn, unique work of art. No matter what the meaning, a tattoo is a personal piece of body art. Take the time to consider what your tattoo means to you and feel confident with your results!